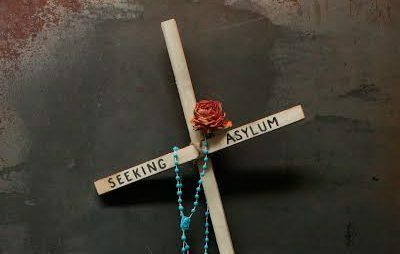 University of Wisconsin graduate student J. Leigh Garcia is holding her MA thesis exhibition, “Seeking Asylum,” at the Humanities building. 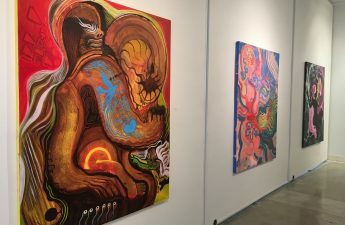 The exhibit opened Feb. 18, and will be closing on Feb. 23. The installment is inspired by her correspondence with six undocumented men who are facing deportation. The Badger Herald talked with Leigh about her project and its inspirations. The Badger Herald: Tell us about yourself. J. Leigh Garcia: I’m from Dallas, Texas. I’m half Mexican, half white. So, that’s kind of how I got interested in immigration. I’m a grad student in the art department here, in printmaking. Printmaking is really good for political work because it has a history of being used as a way to spread propaganda or political statements, so that’s how I got into printmaking. But the installation I’m doing has very little printmaking. BH: You wrote letters to six men facing deportation. How did you find out who these people were? How did you start talking to them? LG: It’s hard because there’s so many people that I could have talked to that are undocumented and facing deportation, but it’s such a sensitive subject. It’s hard as an outsider to approach them. I actually have a professor, Emily Arthur, here in printmaking whose childhood best friend is a writer who works with a non-profit in Georgia. They have a house called El Refugio. They housed the families of the men who are facing deportation. Their families want to come visit them on the weekends, and since they don’t have a place to stay, this organization helps them with that. She’s the one who gave me the contact. I started with 40 different men and wrote them all a letter, and about 20 of the letters were returned straight from the detention center to me, most likely because they were already deported. That was the first round of letters that I got back. It was a setback, and it was really emotional for me. Over time, I got used to getting them back in the mail. I have them still, as a record. BH: Were the men all in the same detention center? Did they know each other? LG: I don’t know if they knew each other. I felt weird asking them if they knew a certain name because I want to keep their anonymity and to protect their rights. I think the detention center is a big one; it might be solely for immigration. There’s actually one close by in Dodge County that has a couple pods of immigrants that are facing deportation. I volunteered there a few times. BH: How long were you in correspondence with the six men? Do you still talk to them? LG: I’m only talking to about two or three now. The letters just slowly stopped coming, because they’ve probably been deported. Stewart Detention Center has a really high rate of deportation. I think it’s actually the highest in the country. The judge there is really strict. I’m only writing to two guys right now. But now and then I’ll get one from an extra guy that I’ve never heard from before. One of them for sure is getting deported in March. He’s just waiting for a court date. He’s kind of the last guy. We write back and forth pretty often. BH: What kinds of stuff did you talk about? Did they just volunteer their stories to you? LG: Yes. It was surprising because they were so open about their stories. You can tell that there’s a need for their story to be told — they will send three or four handwritten pages. When I ask them questions, they are very open about it. A lot of them are in detention because they got DUIs. It’s a cultural difference — in Mexico and other Latin American countries, drinking and driving is not a big deal at all. It’s not seen as that horrible of a thing. My favorite story is about a man I call Birdman. He came over about 15 years ago with a group of about 30 people. They hired what’s called a coyote to help them cross the border. They were traveling by foot through the Texas Chihuahuan Desert with about 100 degree heat, and the border control found them. He hid in a bush and all 32 other people got picked up and deported immediately. He was hiding behind the bush for two hours, and then for two days after that he was in the desert by himself. He said he didn’t have any water or food for two days. He was in the desert dying from dehydration, and saw a little red bird. He followed it and it led him to a town. It’s a symbolic and beautiful story. He followed it to a town in Arizona, and then saw this other Hispanic guy who was working on the side of the road. He went up to the guy and started speaking Spanish, and the guy told him to pretend to be doing road work. He started doing the construction. Some border control agents were going by, and so the guy knew he would have gotten caught. The worker said to go down this road, and there’s a guy there who will hire you. So, Birdman found work. BH: Do the men have similar stories, or are they drastically different? LG: They’re actually pretty different. I was expecting them all to be Mexican and to have come over the border, maybe driving or walking. The most surprising thing to me is where they’re from. Most of them are from South America, Ecuador even, and Honduras and Guatemala. Where I volunteer at Dodge County, there are people from China, Cameroon, all over. People from Africa even. They go through Central America, up into Mexico, and then they cross that border. It’s not even really Mexicans coming over, which I think is really interesting. One guy from Ecuador had a story about crossing over by boat, and the boat almost capsized. There were women screaming and crying. They got caught because of the big scene. Just things like that you don’t even think about. BH: Where did this idea stem from? LG: I grew interest in this because my grandpa came over illegally. In 1940 he crossed the river, and then he ended up getting some kind of false document because he has citizenship here. Also, about a year ago, a friend posted a link on Facebook about this county in Texas about a hundred miles north of the border. People die in this county every week. Baylor University went down there because they heard about this cemetery full of undocumented people. They went to the county expecting to find 15 or so bodies, but they found 356. They were buried in really deplorable conditions, like six inches underground, or in trash bags or milk crates. From there I started doing research. If you have to die just to get here, it makes me emotional because I take it for granted, and I think a lot of us do. 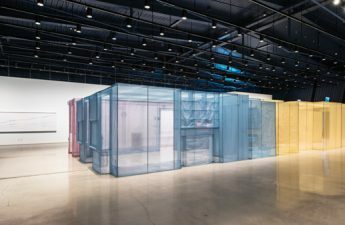 BH: What about your exhibit makes it interactive? LG: The show is going to be in the dark. Everyone is going to be given a flashlight before they enter the space. There is a chain link fence that I made out of rope and paper that you have to crawl through. The installation has sand all over the ground and random pieces of clothing. I imagine it will shift a lot with people moving through. It’s supposed to be immersive. It’s supposed to transport you to the mind of someone who might be dehydrated or stressed. BH: What is the message you would like people to take away from the installment? LG: It’s really important that people are starting to pay attention to these things. I feel like my role as an artist in this installation is about giving a voice to people that are undocumented. In so many ways, they are silenced. What I would like people to take away is that, and to be appreciative of everything that we have and to realize that people actually do risk their lives to be here.